Were the ancient stone rings of England connected with spook lights? The Marfa Lights: Mysterious and unexplained lights that have been reported in the area for over one hundred years, have been the subject of many theories. The first recorded sighting of the lights was made by rancher Robert Ellison in 1883. Variously explained as campfires, phosphorescent minerals, swamp gas, static electricity, St. Elmos's fire, and "Ghost lights," the lights reportedly change colors, move about, and change in intensity. Scholars have reported over seventy-five local folk tales dealing with the unexplained phenomenon. The Marfa lights are just one example of a mysterious phenomenon sometimes referred to as "spook" lights. As the sign suggests, many explanations for these lights have been offered but, so far, there is no proof that any of them are correct. One of the most famous sightings of the Marfa lights occurred in 1973 when two geologists, Elwood Wright and Pat Kenney, observed two lights and tried to track them down. At first they used a jeep, then later proceeded on foot. They never caught up with them, but the scientists were left with the unnerving impression that the lights were toying with them. Other locations in the United States that are well known for "spook lights" are Maco Station and Brown Mountain, North Carolina; Ada, Oklahoma; Uinta Basin, Utah; and Washington Township, New Jersey. Although these represent some of the most active locations, reports of lights like this have been cataloged from almost a hundred different areas within the United States alone. Many additional reports have come from locations around the world. What causes the lights? What do these locations have in common? Some scientists suggest that it is seismic activity. Many of these locations are in geologically unstable regions with faults. Faults are fractures in the earth's crust that may shift during earthquakes or tremors. It may be that the lights are the result of static electric charges that build up as rock moves against rock underground. Some spook lights have actually been seen during violent earthquakes, but most would have had to been generated by movements in the faults too small to been noticed. It may also be possible that there is no one single explanation for spook lights, but that there are a variety of causes. There are a number of bizarre electrical phenomenons (like ball lightning) that might be responsible for some reports. Glowing methane (swamp gas) created by the decay of dead plant material may also cause sightings. Finally, unusual atmospheric conditions may cause mirages that reflect and magnify light from extremely distant sources. Even if we don't know what causes the lights we can see that they apparently had an effect on our history and archaeology. There seem to be quite a few ancient sacred sites located near places where spook lights have been observed. Could this unexplained phenomena have inspired the ancients to build their temples? We know for sure a temple was built in the western mountains of China to observe the "Bodhisattva Lights." 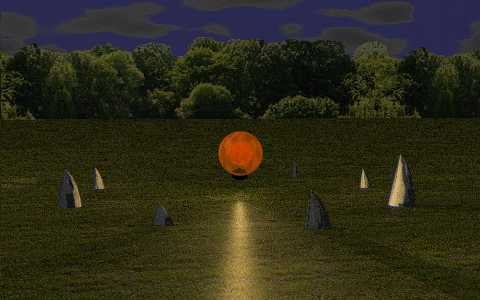 In 1937 the writer John Blofeld described the lights as "fluffy balls of orange-colored fire, moving through space, unhurried and majestic..."
Orange balls were also seen in 1989 near the great stone circle of Avebury in England and at the Castlerigg Ring in 1919. An observer at Castlerigg said, "We then saw a number of lights in the direction of the Druidical circle. Whilst we were watching, one of the lights came straight to the spot where we were standing; at first very faint, as it approached the light increased in intensity. When it came close it slowed down, stopped, quivered and slowly went out." So what are these things? Are they related to the reports from WWII pilots about orange balls, referred to as "foo fighters", that followed Allied aircraft? Are these things weird electrical phenomena or some kind of UFOs? Only time, and scientific investigation, will tell us for sure.